Plants perennial (occasionally biennial), often matted; taproot stout. 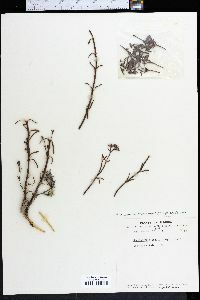 Stems prostrate to ascending, branched especially distally, retrorsely to spreading-pubescent throughout (when pubescent); flowering stems 8-48 cm; sterile stems 2-10 cm. 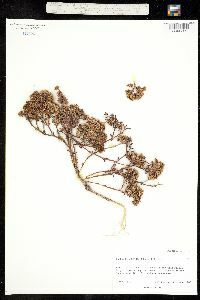 Leaves: stipules ovate-lanceolate, 2-12 mm, apex acuminate, entire; blade linear to spatulate-oblanceolate, 4-40 × 1-4 mm, leathery, apex obtuse to acute, moderately antrorsely pubescent. Cymes terminal, 15-200+-flowered, branched, densely to loosely grouped to form subcorymbose clusters 5-50 mm wide. 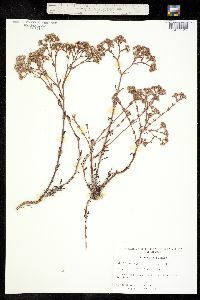 Flowers 5-merous, narrowly ellipsoid, with slightly enlarged hypanthium and calyx tapering distally, 2.3-3.5 mm, glabrous to slightly puberulent proximally with straight to hooked hairs; sepals red-brown, white or whitish distally, veins absent, narrowly oblong to lanceolate-oblong, 1.4-2 mm, papery, margins white, ca. 0.1 mm wide, papery, apex rounded, hood formed from slight incurving, awn or mucro absent; staminodes narrowly oblong, 0.4 mm; style 1, cleft in distal 1/ 10, 1.3-1.7 mm. Utricles ovoid to ellipsoid, 1-1.2 mm, rugulose, glabrous. Flowering spring-fall. Coastal dunes, sandflats, pine/oak woodlands; 0-100 m; Ala., Fla., La., Miss. 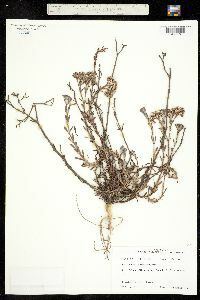 Plants with pubescent stems, strigose leaves, and pubescent receptacles have been recognized as var. corymbosa.